Three of us (Manohar, Harsha and me) had a good ride last Saturday (10th June). We got together at the Kanakapura Road-Outer Ring road junction at 6:30 AM. We had nothing particular in mind. I was keen that we go a bit on Kanakapura road, take a diversion towards Bannerghatta road and then return back home. I had imagined a 3-4 hour ride at the most. Manohar had a few destinations in mind - but he opined that most of them would result in much shorter rides. So, we rode on Kanakapura road without any idea for sometime. We had a short tea break just after YDIT (that's Yellamma Dasappa Institute of Technology for you, one of the unknown engineering colleges of Bangalore! PS: if you are from YDIT, then flame me not - this is just written in jest 😉 ) We soon crossed the NICE road-under-construction. And ideas started flowing in. All the time, we were pedalling mostly downhill. Harsha and Manohar were imagining what their plight would be while coming back :-). We quickly passed AOL(Art of Living). Without any verbal agreement, we somehow settled on Yogavana Betta. There was considerable greenery on the roadside and I was wearing my Sunglasses too. Before I had them, I always used to think that Sunglasses were more of a fashion accessory. But now I have experienced that they make you more comfortable. You don't feel the heat as much while wearing them. Highly recommended! A couple of lakes on the right completed the experience. At 8, just after Somanahalli, we had another tea break. We were tempted by the Gulkan-Bun at the village shop and tried one apiece. Too much sugar in the Gulkan spoilt the taste. But the other things were good. After the break, we pedalled for a few minutes, and then turned right. The road from now was largely untarred but not very bad to ride. In about ten minutes, we sighted a temple atop a hill. The road forks here - with the right leading to Ramanagar. Manohar had come here before, and he doubled up as a guide. We took a left. Harsha seemed a bit tired, and sat on a few rock slabs in the cool shade of a large tree. Manohar and me decided to go to the top of the hill to the temple. The climb to the hill wasn't very steep. However, the mud road had a lot of stones. Flowing water had carved a few paths right in the road. The mud was also quite loose. I figured I couldn't continue after sometime - largely due to the loose sand. We both decided that we'd return another day and pedal up. But for now, pushing was the key! We didn't need to push much for it is just a small hill. There is a flight of steps to climb before one reaches the top. So we had to leave the cycles behind. We quickly reached the top of the hill. We thought that this itself is Yogavana Betta. And the proof was right in front of our eyes - somebody was meditating on the rocks. The top of the hill has a temple, lots of rocks. And the visitors are rewarded with a panoramic view of the surrounding places. The rocks of Ramanagar are plainly visible from here. So are a few largish lakes, acres of greenery and many roads unexplored. We spent quite a bit of time, enjoying the scene. Took a few snaps, etc. As we were about to leave, the meditating man got up. Turned out that he was from Bangalore as well. He told us that this wasn't Yogavana Hills. 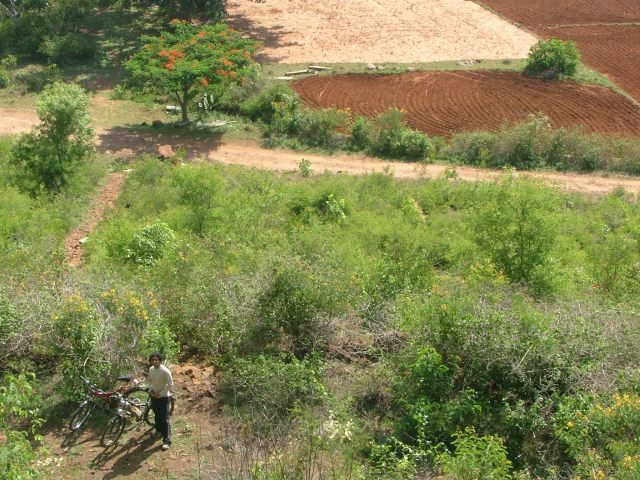 He told us that to reach Yogavana Hills, we'd have to take the mud road and go ahead for some more time. He told us that some sanyasi lived in those hills - and that he wanted to stay away. It was getting late (9 AM and the indication: Harsha's missed calls). Me and Manohar made a mental note to come back here again, as time permitted. Going down the road (which we couldn't climb) was fun. It just didn't last long enough 🙁 We reached Harsha in a few minutes and told him all the wonderful things we had seen. Ofcourse, all the time adding a bit of spice to show him what he had missed! By this time, Harsha was in serious time trouble. I had told him that we'd be back in 3-4 hours and that much time was already spent. He had a bit of shopping to do and was getting a few calls from home. And why not ? His marriage was exactly two days later. How many people you know would even have come cycling in such circumstances?? I was keen on coming back over Bannerghatta. 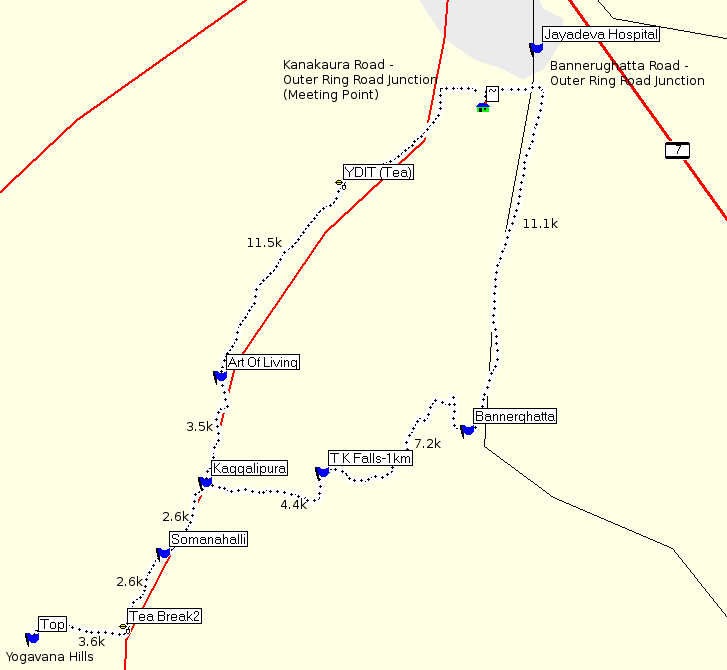 We went back to Kaggalipura and then took a right turn towards Bannerghatta (about 12 kms from there). I imagined that going back on Kanakapura road made very less difference compared to this. My argument was that our target altitude was the same. I was soon proven wrong. The road to Bannerghatta proved to be a tougher ride than we imagined. And this was largely due to the ups(good ones!) and downs(makes life worse, because you again have to gain the altitude that you lost!) that we had to ride over. I remember atleast three good climbs and my friends were panting a bit. We reached Bannerghatta at 11:22, having started from Kaggalipura at 10:08. That's about 1 hr 12 mins for a measly 12 kms. If that doesn't tell you that it was difficult, nothing else will 🙂 Manohar arrived about about 10 minutes behind us - having pushed his bike up one of the climbs. A bit of water supply, and he would have been better. The road from Kaggalipura to Bannerghatta is a good ride - try it when you have the time and you won't be disappointed. The greenery around the road is pretty good. And you can visit T. K. Falls if you have the time (go look at the map for the location). We had a hearty breakfast and then started back home. Coming back, Harsha was on fire and I was right on his tail. We were in Arkere in 25 minutes. Manohar wasn't trailing by much too. We reached outer ring road and Harsha separated. I dropped off near JP Nagar. All in all, a good ride of about 60 kms. Scroll the image below to see the altitude profile (meters above sea level) of our ride. Thanks Srini. 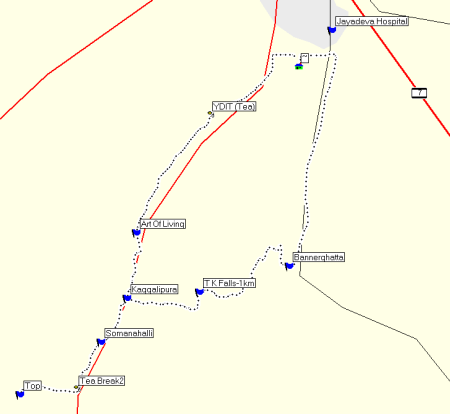 And yes, I am making good progress towards my goal of having a trail database. What you get up to when the Aussie is away! Like the Jersey…. Up for a ride saturday and or sunday? Have been an armchair cycling enthusiast. Am at a healthy 49 (see how i cling to 49) Cycling Trails like what you have described sound very refreshing. Would like to join ppl who wud’nt mind company and chk out if I can physically last out. Can you guys suggest a begining? Was going through your blog entries. I am planning to go for the MTB Himachal (http://mtbhimachal.sifymax.com/) this October. How would a Hero Thunder fare for the trip?? Hi guys, thanks for sharing your experience and a new route. We are 6 guys who always enjoy riding, so if you find any other route like this, I request if possible please mail be, its a request. hi shree, tell me where does this TK falls comes? in this link there are 2 TK falls, which one did u visit. TK falls is near to Kanakapura road or Bannerghatta? 14 ppl , 7 bikes.. Very well written information. It will be beneficial to anyone who employess it, as well as me. Keep doing what you are doing – for sure i will check out more posts.